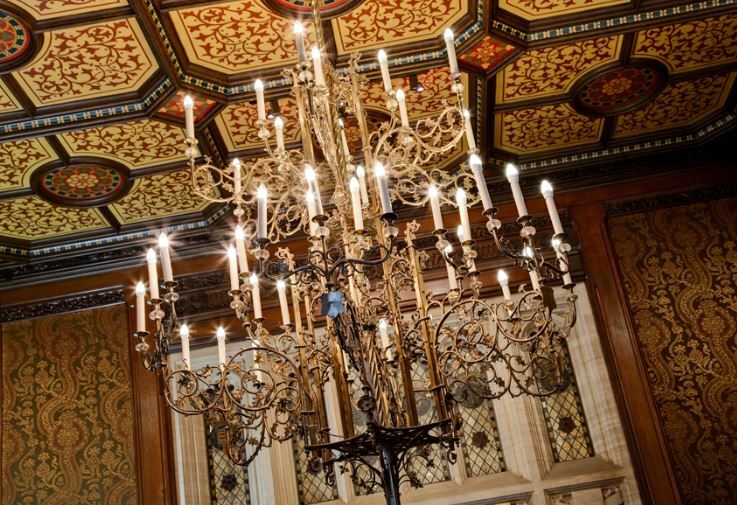 We were involved in the restoration of the Palace of Westminster for some 30 years, restoring and manufacturing beautiful chandeliers for various areas including the chambers in the House of Commons and the House of Lords as well as many other important spaces. Much of our work at the Palace was with Donald Insall Associates, a leading conservation architecture practice with over 50 years’ experience in the care, repair and adaptation of historic buildings and places. Our lighting archive has been an invaluable resource here in ensuring that the architectural integrity of our work remained, while bringing the fittings up to date to meet current regulations. Shown here is the beautiful chandelier in the Pugin Room, a restaurant and venue within the Palace that is open to the public. Donald Insall worked with a variety of specialists to reinvigorate this space which dates back to 1847 including historic interior experts Allyson McDermott as well as joinery and furniture restorers.